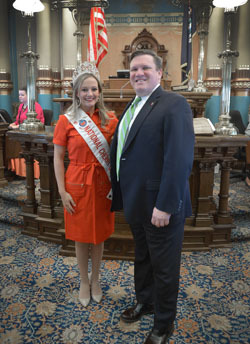 TRAVERSE CITY, Mich. — Sen. Wayne Schmidt, R-Traverse City, welcomed Ashley Schichtel to the state Capitol on Tuesday. Schichtel, who was named Michigan cherry queen last year, made the trip to Lansing for Michigan Agriculture Day at the Capitol. Editor’s note: A print-quality version of the above photograph is available by clicking on the image or by visiting SenatorWayneSchmidt.com/photowire. Photo caption: Sen. Wayne Schmidt, R-Traverse City, stops for a photo on the Senate floor with Michigan Cherry Queen Ashley Schichtel during her visit to Lansing on Tuesday.